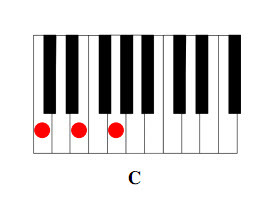 This entry was posted in Piano Lessons and tagged free piano chord chart, piano chord chart, piano chords, printable piano chord chart by Bill. Bookmark the permalink. thank you for the chord chart and being on facebook.. Thank You for the chord charts, they are just what I’ve been looking for. putting the $ first the world would be a much kinder and gentler place. My sheet music indicates Bflat9. What are the keys that the “9” calls for? It depends on the way it’s written. If it’s Bb(9), or just Bb9, then it’s just a Bb7 chord (Bb – D – F – Ab) with an added 9th (C). If it’s B(b9), then it’s a B7 chord (B – D# – F# – A) with an added, flatted 9th (C). Thank you sooo much for posting this chart. It is a great help! Woo-hoo!! I have been looking for a printable chart!!! Thank a bunch!! Thank you so much for you piano chord charts, exactly what I needed! I must have gone to 25 web sites that had chord charts where they wouldn’t print, were too small or too crowded together. I will not forget your site. You are the real deal. What a great marketing idea. If I buy any lessons or info, it will be from you. Thanks ….. Bill … Appreciate your kind gesture.